Further east, I stumbled upon more ruins. You can probably tell by now that I am fascinated with well used stairways that seemingly lead nowhere. Still further east I found another chapel filled with columns. This one was smaller. 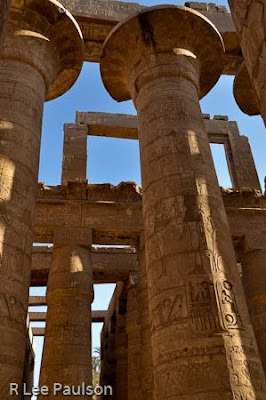 Notice the tops of the columns here have a different shape than the ones shown before. Here one can see the column tops more clearly. 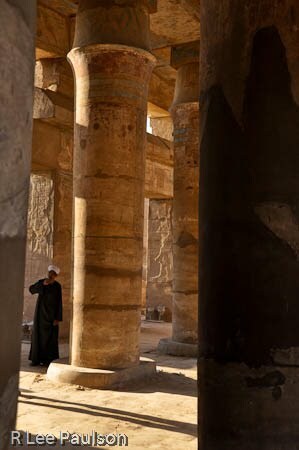 In this chapel, none of the columns were inscribed with carved hieroglyphs as in the main hypostyle hall. It was time to meet up with the group so I began working my way back to the front of the temple. On the way, I found a nice example of a carved scarab. 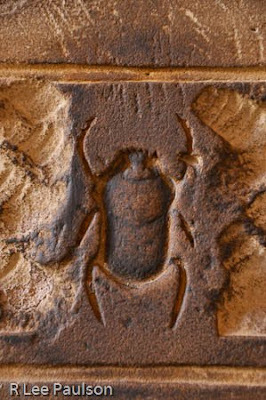 Folks have wondered why the scarab seems to play an important symbolic role in ancient Egyptian funerary symbolism. In one of the Mummy movies the bad guys were eaten alive by hordes of carnivorous scarabs. West suggested a different symbolism. A scarab lays its eggs in a ball of dung, and then pushes that ball around, keeping it warm until the eggs hatch, and from the ball of dung new life flies away. West claims this is yet one more symbol of rebirth, new life being created out of what remains of the old. 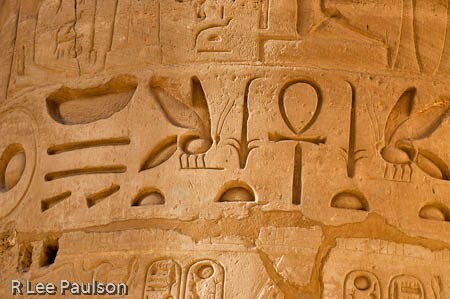 Also, the scarab's life cycle, with the new life flying away, symbolized, he said, a soul being set free from the physical and returning to its source. 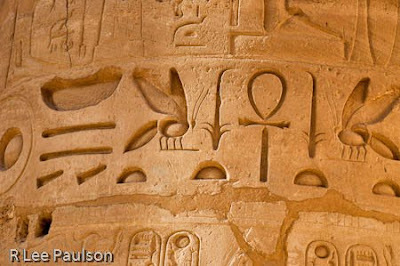 Also, as I returned to the group, I saw some hieroglyphics with some nice side lighting. These were carved out of sand stone, which accounts for the graininess. Still, notice how perfectly each glyph has been rendered. 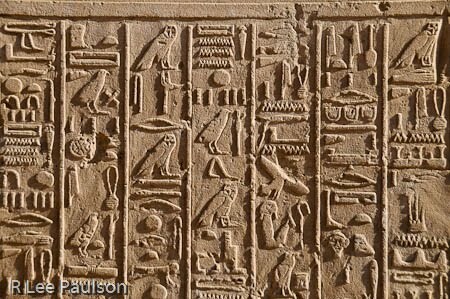 Raised reliefs like this are much harder to carve then ones that are merely inscribed into the surface. I can't imagine the painstaking work involved in carving these. I saw them everywhere. The image rendered on my screen is about half the size of what I remembered the life sized versions to be. 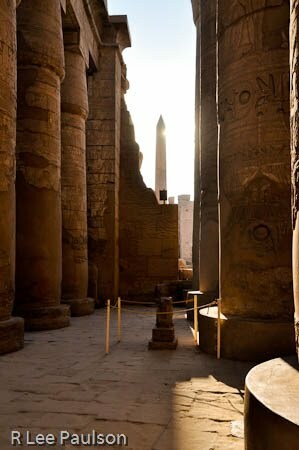 As I made my way back, a glint of sun caught my eye, and I turned to get another view of Hatshepsut's obelisk. 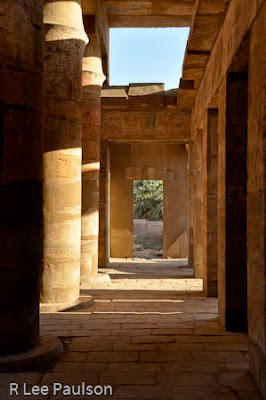 We're now back in the main hypostyle hall. I haven't found our group, yet. 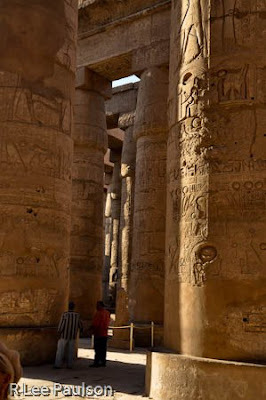 Notice how deeply these glyphs have been cut into the columns. Yet another example of very sophisticated stone work. At one time, there was a grand boulevard, if you will, between this temple, which was dedicated to the One God, Amun, and the Luxor Temple, approximately a mile and a quarter away. 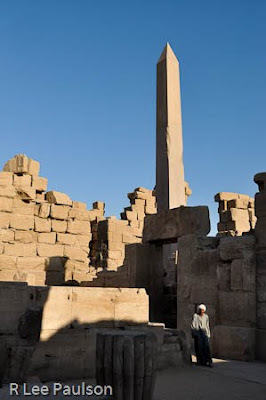 Once a year, a statue of Amun was taken, amid a great deal of fanfare, from its permanent residence in this temple to the Luxor Temple, where it spent some time before returning. This was a time of celebration and feasting. We had seen the Temple of Luxor only a couple of nights before (Pictures of it were shown in Post 14 and 15). Let's pretend that memories of that temple are still fresh in your mind. If Schwaller de Lubicz is correct in his assertion that the Luxor temple was really 'the Temple of Man', then what the ancients were reenacting each year was the act of The One descending into flesh, if you will. More on that in the next post when we wrap up Karnak temple. 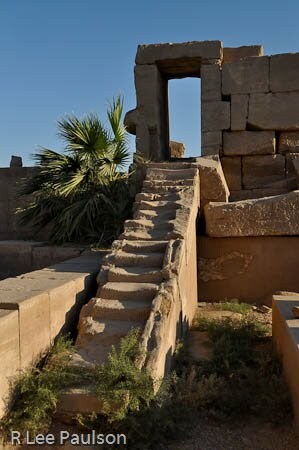 Continue on to Post 32: Karnak Temple III by clicking here.